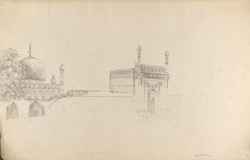 Pencil drawing of the gateway to the Jami Masjid at Bijapur in Kerala by George Boyd (1800-1850) dated between 1821 and 1844. This is one of 95 drawings (90 folios), chiefly of landscapes and monuments in the Deccan, West India and Afghanistan made during that period. Originally named Vijayapura, or the ‘City of Victory’, Bijapur was established during the reign of the Chalukyan dynasty of Kalyani between the 10th and 11th centuries. It was later the capital of Ali Adil Shah (1558-80), the fifth king of the Adil Shahi dynasty. He commenced the Jami Masjid, or congregational mosque, but it was not completed until 1686. 75 magnificent arches, finely decorated with plasterwork, support the roof of the courtyard. The mosque is still used for worship and inside there is a beautiful copy of the Quran, the book of holy Muslim scriptures, written in gold.